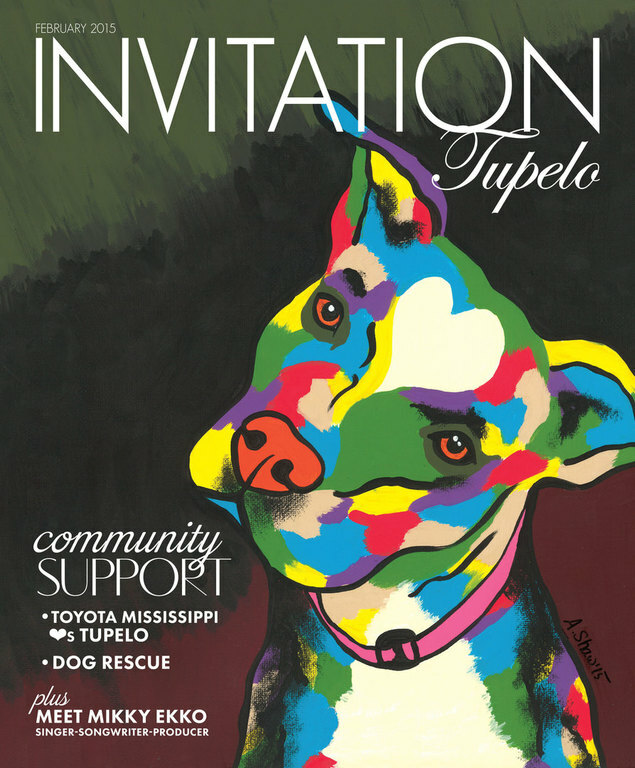 Aimee Shaw paints whimsical portraits of beloved pets to raise money for her north Mississippi dog rescue operation. The larger-than-life dog painting hanging in the playroom of Lori Davis’s Jayess, Miss., home is more than just lively decor to amuse her grandchildren. For Davis, the brightly colored image is an homage to a family friend. 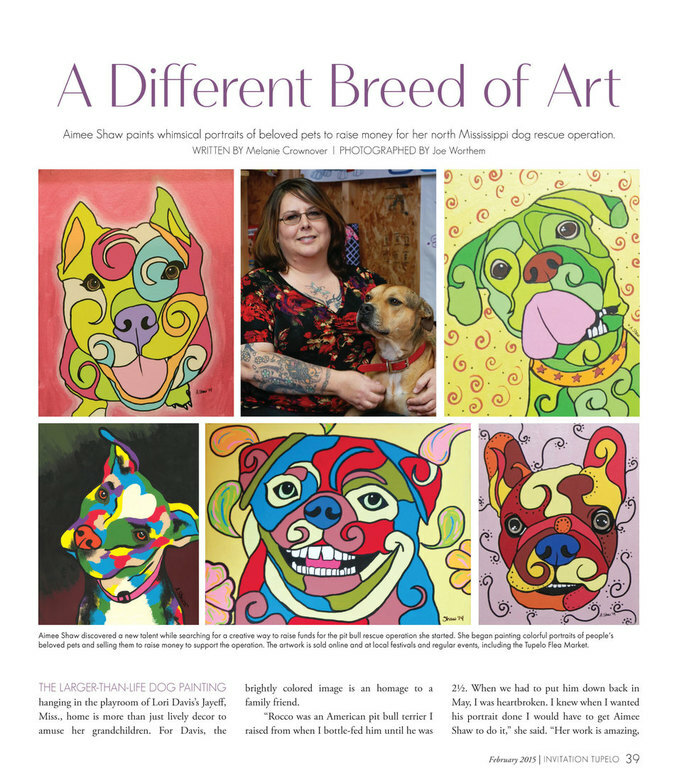 Shaw, a full-time graphic designer, began painting the portraits to fund her passion: rescuing dogs with Shaw Pit Bull Rescue in New Hope, Miss. 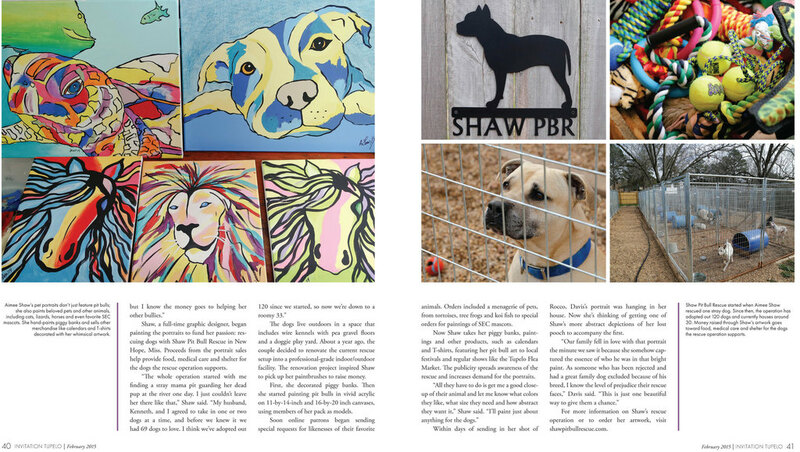 Proceeds from the portrait sales help provide food, medical care and shelter for the dogs the rescue operation supports. 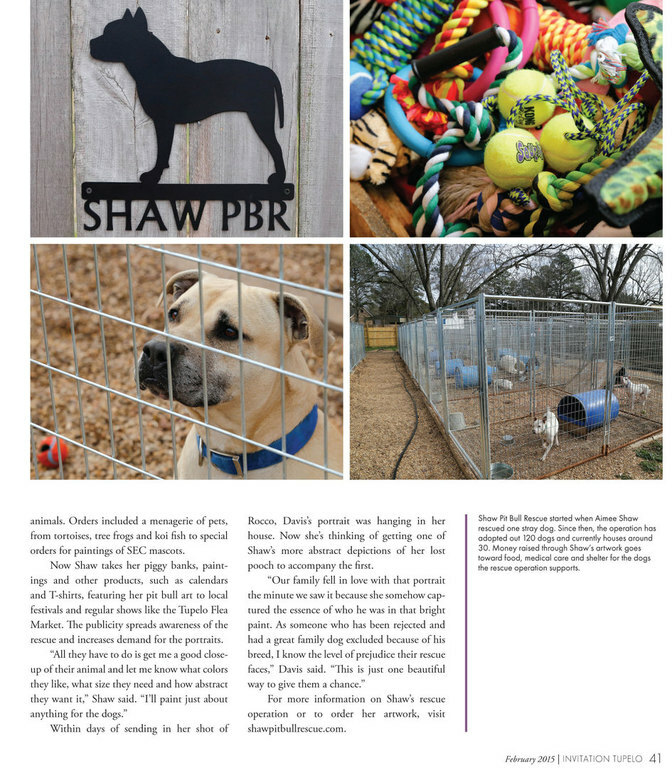 The dogs live outdoors in a space that includes wire kennels with pea gravel floors and a doggie play yard. About a year ago, the couple decided to renovate the current rescue setup into a professional-grade indoor/outdoor facility. The renovation project inspired Shaw to pick up her paintbrushes to raise money. First, she decorated piggy banks. 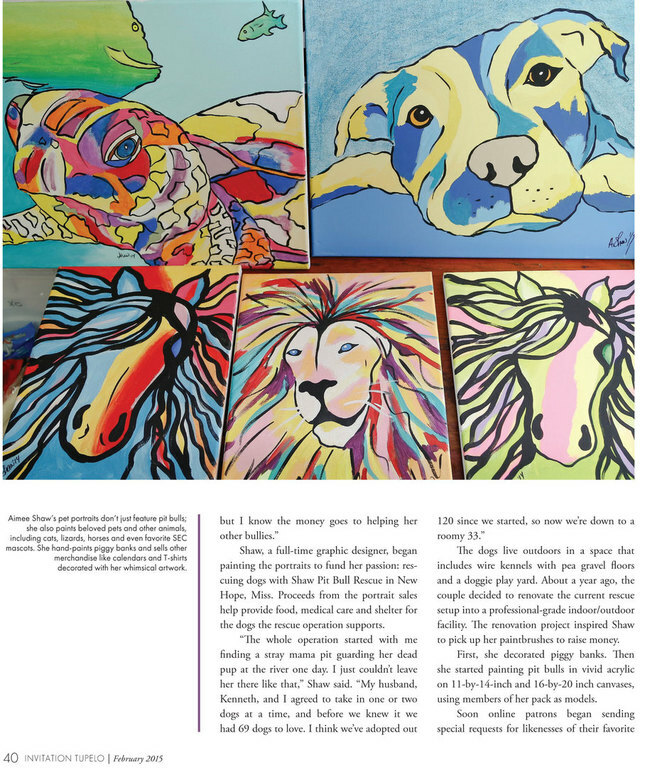 Then she started painting pit bulls in vivid acrylic on 11-by-14-inch and 16-by-20 inch canvases, using members of her pack as models. Soon online patrons began sending special requests for likenesses of their favorite animals. Orders included a menagerie of pets, from tortoises, tree frogs and koi fish to special orders for paintings of SEC mascots. 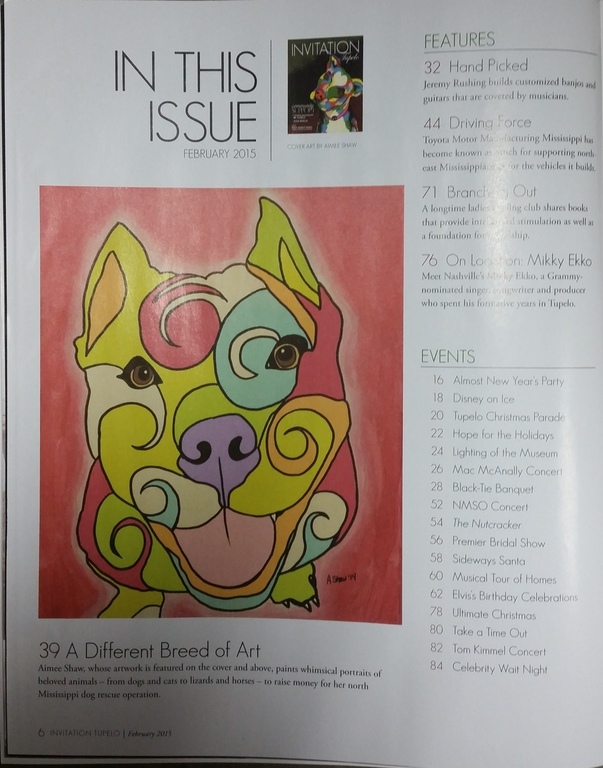 Now Shaw takes her piggy banks, paintings and other products, such as calendars and T-shirts, featuring her pit bull art to local festivals and regular shows like the Tupelo Flea Market. 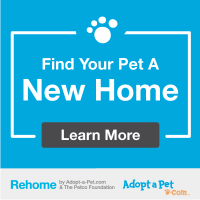 The publicity spreads awareness of the rescue and increases demand for the portraits. Within days of sending in her shot of Roco, Davis’s portrait was hanging in her house. Now she’s thinking of getting one of Shaw’s more abstract depictions of her lost pooch to accompany the first.